Every witch needs her own cauldron. Here's how to make your own paper mache little witch's cauldron for Halloween. We plaited black raffia for the handle. It makes a sturdy handle which keeps a good shape. However you could also plait strips of black plastic rubbish bag, staple on a cardboard handle or just use string. We used diluted white PVA glue (mix of half glue, half water) for the paste. Check out Ultimate Paper Mache website for a flour and water paste recipe. You could also use wallpaper paste. Blow up a balloon. This will make a cauldron the same size and shape as the balloon. Tear up newspaper into small pieces. 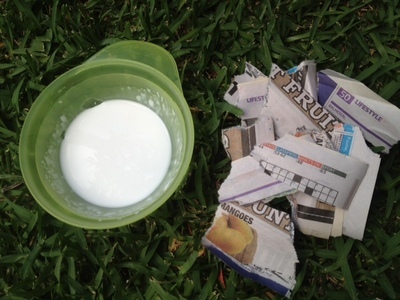 Dip the newspaper pieces into the paste and cover the bottom half of the balloon to make a deep bowl shape. Keep adding more layers (at least three layers). Allow to dry for a few hours then pop the balloon to leave a deep paper bowl. Add some more newspaper and paste layers over the rim of the cauldron to give a neat edge which is also sturdy. Add any more layers to areas of the cauldron that feel thin. Allow to dry then cover inside and out with black acrylic paint. When dry, carefully poke a hole in each side of the cauldron (about an inch down from the top edge) using a skewer. Cut six strands of black raffia about 50cm long each. Make three sets of double strands and then plait into a single rope. Twist the ends of the rope well and push into the two holes in the cauldron from the outside inwards to make a handle. Tie a knot at each end inside the cauldron. Varnish your cauldron if you want it to have a shiny finish. Your paper mache cauldron is now ready to use. Happy spell making or trick-or-treating!